Welcome to Dar Zayna! 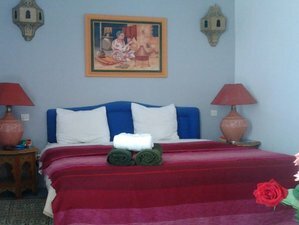 This riad in Essaouira is an establishment located in the heart of the old Medina. Combining comfort and conviviality, Dar Zayna will make sure you experience a unique and authentic stay. Not only the hotel, but the activities are also abundant. Situated only five minutes from the beach, you can catch the waves with your board, either it's surfing or kite surfing. Come and you will see it yourself! Dar Zayna offers luxurious rooms, free Wi-Fi throughout the house, restaurant, concierge service, and spa. It is indeed the new trend of travelers in search of traditional Moroccan authenticity. Dar Zayna is also a place for relaxation. All rooms and suites at Dar Zayna are Moroccan-style decors and each has a different private bathroom with a shower. This traditional Moroccan house is located in the Medina district of Essaouira, near the old town and only five minutes’ walk from the beach. It features a hammam and free Wi-Fi. You can enjoy Moroccan cuisine in the restaurant and relax on the terrace. The reception is open 24 hours a day and an airport shuttle service is also available. It is a double room decorated with antique furniture and paintings by local masters. It is equipped with a king size bed, small sitting area, an office, and a bathroom WC. It is about 18 square meters, located on the first floor. It is a room for two people furnished with Moroccan handicrafts and paintings of local masters. It is equipped with a king size bed or two twin beds, an office, and a bathroom toilet. It is about 15 square meters located on the first floor. It is a double room decorated with antique Moroccan furniture and paintings by local masters. It is equipped with a king size bed, small sitting area, an office, and a bathroom WC. It is about 18 square meters located on the second floor. It is a room for two people with its wooden ceiling. It is decorated with antique furniture and paintings of local masters. The room is equipped with a large bed (king size), a small sitting area and a bathroom WC. It is about 18 square meters located on the ground floor. Dar Zayna is located is located in the Medina district of Essaouira, Morocco, near the old town and only five minutes’ walk from the beach. Breakfast will be served every morning on a sunny terrace. Dar Zayna is one of the best situated hotels in the city of Essaouira offering an original accommodation and a unique cultural experience. Children 1 - 10 years old are free of charge (staying in parents room). 1 extra bed is 31 EUR.